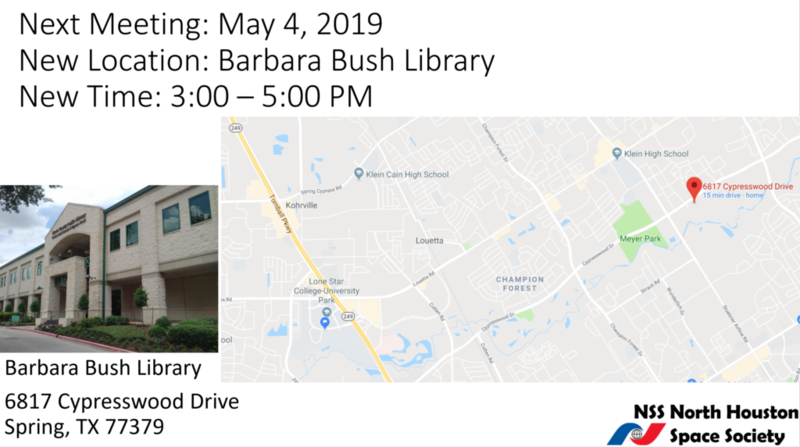 Join NSS North Houston Space Society on May 4, 2019 from 3:00-5:00 PM at the Barbara Bush Library (6817 Cypresswood Drive Spring, TX 77379). Learn about the latest happenings in space exploration and about what is just around the corner. Talk to fellow members. (Our members include people of all walks of life. Some have experience in space exploration, some are engineers in other fields, some are business people, programmers, sci-fi writers, students, and people that are interested.) Discussing space exploration with others that are interested in it too is one of the benefits of coming to a NSS meeting. The May 4th meeting will also feature Herb Baker, Former Manager at NASA/Johnson Space Center. His office provided contract management support to the Flight Operations Directorate, the Safety & Mission Assurance Office, the Human Resources (HR) office, and the Office of the CFO at the Johnson Space Center and included support to operations at NASA’s aircraft operations at Ellington Field. This support covered activities within Mission Control, the Astronaut Office, the Neutral Buoyancy Laboratory, and the Space Vehicle Mockup Facility among others.